Tiramisu Cake Topped with Zabaglione Cream is a recipe I wish I would have found years ago. I’ve seen countless recipes for Tiramisu, a very popular Italian dessert, and I’ve made quite a few recipe variations , but I’d never seen it made in a cake form. The idea was intriguing because it kept the delicious flavor of the original sweet but with common ingredients. The minute I saw the recipe it peaked my interest. I knew that I had to make it! Then the perfect opportunity arose. . . our son’s and grandson’s birthday celebration was soon approaching. For some time we’d been planning on a family fish fry, but as busy families go, work and sport schedules made it impossible. When two birthdays came up in the same week we thought it an ideal time to combine the two celebrations and enjoy a rollicking family feast. My Honey was going to fry some of the nice flounder and sea trout he’d caught while on Saint Simons Island. I was going to bring the desserts, Strawberry No Churn Ice Cream and Tiramisu Cake Topped With Zabaglione Cream. I was also going to make Panzanella Salad and were also going to bring the home-made bread — hoagie rolls and baguettes. The family get-together was going great. Lots of talking — lots of teasing — lots of food sampling — just a typical Italian family feast. I was smiling from ear to ear looking in awe and pride at our children, their spouses, the three older grandsons and then cooing and gushing over the adorable one month old grandson– you moms and dads and nonnas and papas know what I’m talking about. In the meantime I was doing quite a bit of talking — with hands– which is not unusual. All at once I heard a lot of yums and this is sooo good when I looked. . .
. . .Oh! My! Heavens! The Tiramisu topped with Zabaglione Cream was 3/4 gone!! I had planned on taking a beautifully staged shot of a cut piece of cake on a plate. Unfortunately when our family gets together. . . talking . . .eating . . .having a great time, I’m not thinking of taking photos of food, eating yes, not photos. So, the cake was cut and almost completely devoured before it came to my attention that I didn’t have any photos of the inside of the cake. I grabbed the camera and the pan with the 3/4 eaten cake and went to stand near the kitchen window — natural light, you know. It was really a dreary day but that light was going to have to do. I did get several photos but they certainly weren’t the beautiful shots that Lyuba, the original creator of the recipe had. I do have a reprieve of sorts. Our daughter, who always requests Italian Cream Cake for her birthday, loved this cake so much that she requested it for her birthday this year. Once I make the Tiramisu Cake with Zabaglione Cream again I’ll make sure to cut it properly, put it on a nice plate and make sure that it has the proper stage for its beauty and deliciousness. Then I will add the pictures to this post. Better late than never. This picture was taken when I made the cake for our daughter’s birthday. Simply delicious! This cake will soon become a family favorite. The cake keeps all of the flavor of the original Italian dessert but it’s much easier to make. be sure to save this recipe — you won’t regret it. A delicious variation of the popular Italian dessert with the same name. The bare cake is lightly sprayed with espresso and then topped with Amaretto laced Zabaglione Cream. Preheat the oven to 350 F and grease and flour a 9x13 baking pan. In a bowl, beat butter for about one minute and then add sugar. Beat for another 1 -2 two minutes, until light. Add egg whites one at a time, beating well after each addition. Add vanilla and mix until combined. Sift flour, baking soda, baking powder, salt together. On the low speed of your electric mixer alternate adding the flour mixture and buttermilk starting and ending with the flour mixture. Mix until just combined. Pour the batter into the prepared baking pan and spread out evenly. Bake for about 25-30 minutes, until the toothpick inserted in the center of the pan comes out clean. Place the egg yolks and sugar in the top of a double boiler or a large heat proof bowl over a saucepan that has an inch or two half of water, making a kind of double boiler. With a wire whisk or with the whisk attachment of a hand mixer beat the egg yolks with the sugar until they are completely combined and the mixture has a glossy appearance. Turn on the flame, moderately high until the water boils, then reduce the heat to a simmer and keep whisking. Make sure the bottom of the double boiler or bowl does NOT touch the water. As the water heats the egg mixture it will begin to thicken. As it thickens it will grow in volume. Keep whisking. This takes a little patience but it is well worth the effort. Your zabaglione will be done when it is thick, frothy and holds ribbons form as you whisk it. The temperature reaches 145 to 150 degrees F, on an instant-read thermometer. Take the zabaglione off the heat and continue to whisk. Add the Mascarpone to the whipped yolks and beat until combined. Add the Amaretto liqueur. Cover with plastic wrap and let cool completely. In a separate bowl, that has been chilled along with the beaters, whip the cream to stiff peaks taking care NOT to overbeat and make butter. Gently fold in the whipped cream into the zabaglione mixture and set aside. Put the espresso in a food safe spray bottle. Spray the white cake with the espresso making sure you don't oversaturate. The 1/3 cup of espresso should be just right. If you don't have a spray bottle you can do it by hand-- be sure you don't get too much in one spot. Spread the Zabaglione Cream evenly over the top of the espresso-sprayed cake. Dust the top with cocoa powder and garnish with crushed chocolate chips. 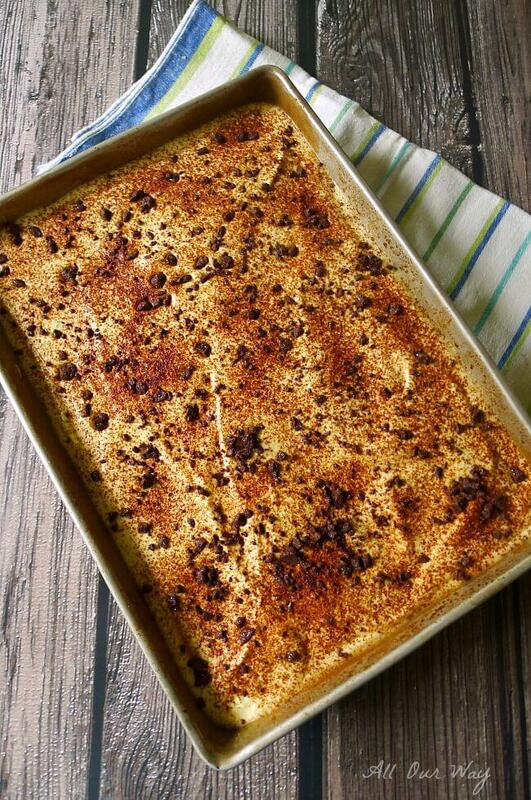 I love tiramisu never thought we can make it as a sheet cake, great idea for the holidays and get together. I am going to give it try for sure. Oh, tiramisu is one of my favorite desserts. I would like to try a piece with a cup of coffee or tea. I’m sure your cake is delicious. Thanks. My family loves tiramisu. And your variant seems to me to be perfect. Looks very nice and delicious. Beautiful color and nice presentation. Of course I want to try. Such a simple approach to a classic flavor! I’m not surprised the first cake was nearly gone before you got a serving photo! I am a sucker for Tiramisu! Anytime I see it on a menu – I know I’m getting it. I haven’t tried making one myself (crazy, I know). Maybe I just will!! I am pretty sure if I made this everyone would swoon over it. I love the cream and cake this idea is absolutely wonderful! you always come up with unique great ideas! Hello, Tammy! If you like tiramisu, you’ll love this cake. Gorgeous! 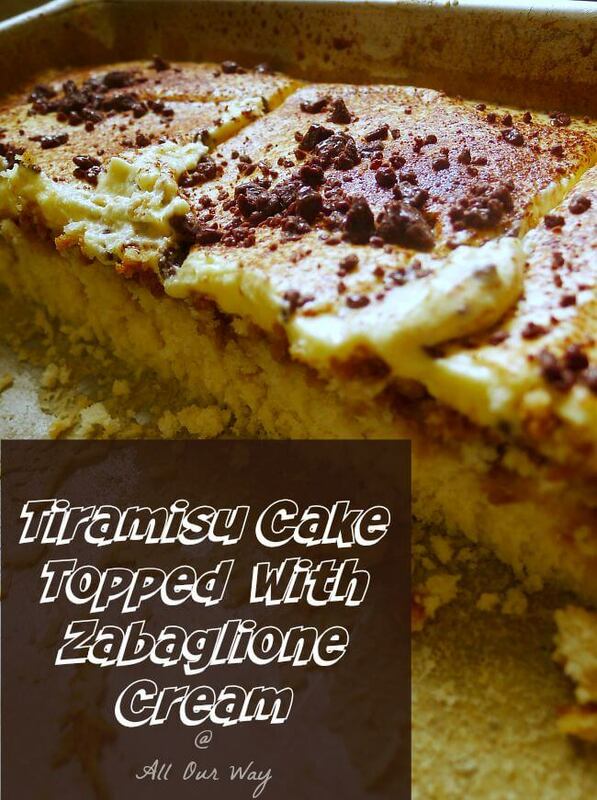 I absolutely love tiramisu and that zabaglione cream sounds so amazing. This is the perfect cake to bring to every pot luch and barbecue this summer. Thank you, Heather! The cake is super popular with our family. I hope you try it out. This is such an awesome dish especially we are taking it along for a party! It is sure a hit with everyone!! Thank you!! It’s always good to know others enjoy it as much as we do. Marisa, I’m drooling. 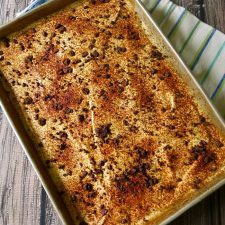 One of my absolute favorite desserts – Tiramisu or Creme brulee. If it’s on the menu then this is it. This sounds so absolutely delish.. I need to try this soon. Would be great to bring along to a BBQ too. Yum! Hi, Veena!! I know how you feel. They are traditional desserts that are always a favorite. I’ve never seen tiramisu in cake for before – how perfect for a family gathering! I’m sure making it again to get more photos will definitely be worth it! Hi, Lauren! It really is easier to serve in cake form. We have a family gathering coming up and I think it’s time to make the cake again. OMG Marisa….you make the BEST recipes. This is my kind of dessert. What a great BBQ party dish. If I lived close to you….I would be bringing wine every night and showing up at your door. I have to make this for a party this summer for sure. Tiramisu is one of my favorite desserts and then in a form of a cake I am in I want a slice right now! Pure bliss and perfection. Perfect way to end a meal. Hi, Adriana! Yes, it is a great way to end a delicious meal. It’s not too heavy. Perfect!! one of our families favorite dessert I actually make often. Never thought about all in one pan. Looks much easier. Bet that topping is wonderful! Hi, Claudia! It is much easier — I’ve made several tiramisu versions and this one is so easy with lots of delicious taste. Well isn’t this the perfect crowd pleasing dessert. I just made tiramisu for the first time during the last holiday season. I know my guests would have loved this version too. I have printed it….and will make it next time. You can never go wrong with the classics like this. Hi, Gloria! That recipe is super easy and so delicious — you don’t have to mess with ladyfingers. Can you believe that I just made tiramisu for the first time last year??? I order it all the time when I go out to dinner. We were hosting a neighbourhood party…and I decided to make this for dessert. I wish I had your recipe….it would have been great. Guess I will be using this for the next party!! What a great take on a classic. I have made tiramisu once, under the very supervised eye of an Italian matriarch that didn’t speak English. I lOVED that experience. The cake version looks so very interesting, I need to try this, it really looks amazing! This looks so tasty. I love the cream top instead of a traditional frosting! Hi, Jenni! The topping isn’t as sweet as a typical frosting. Really compliments the tiramisu. Marisa, this sounds amazing! And I love hearing about your family. They all sound so lovely! I love how you took tiramisu to a whole new level with this beautiful cake. I especially love the cream topping. Your family story brought a smile! We have 4 grown sons and 2 grandsons (1 and 3). All 4 of our sons are amazing in the kitchen, 2 work in the culinary field professionally. All of our family celebrations are centered around food and fun at the table! So, your Tiramisu Cake looks and sounds fabulous, and I would happily eat a slice or 3! That photo is gorgeous BTW! My husband loves Tiramisu! This would be so perfect for his birthday next week. Yum! Hi, Christine!! This is a wonderful recipe. I hope you try it. That cream sounds absolutely amazing! I need to try this cake for our next party! Thanks for sharing! Hello, Analida! The cream is wonderful on the cake. I’m looking forward to making it again. That sounds perfect for a group! And I can certainly see why you’d have trouble holding them off for pretty pictures… I have family who always get tiramisu at Italian restaurants – I’ll have to look at this for the next big get together! Hi, Anne! I’m going to make the cake again and lock it in a room until I can get the photos!! Have a great weekend. I love the taste of tiramisu! I love that you made a cake and topped it with cream! It looks so good that I’m going to have to make one for this weekend’s game day party. My family goes ga-ga over tiramisu too and I can’t wait to see their faces when I serve your delicious cake! My daughter loves tiramisu, but the traditional recipe is sooo labor intensive what with arranging all of those lady fingers. 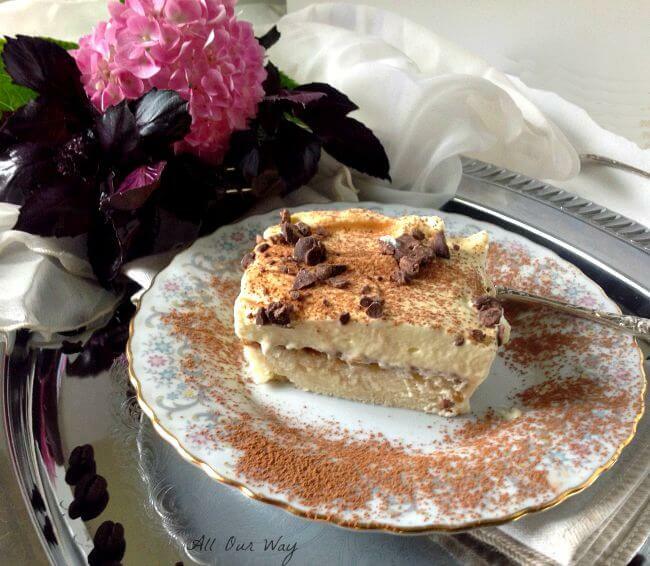 I love this recipe for it’s simplicity as well as for it’s full tiramisu flavor. Hi, Patti! The simplicity is what drew me to it — and after I tasted it –WOW!! Have a wonderful week. This recipe looks and sounds REALLY good! I love tiramisu, but the work involved has kept me from making it, but this recipe, this one I can do! Hello, Rachel! If you want the taste of tiramisu but don’t want the labor? This recipe is for you!! What a fun take on a classic Italian dessert! I’ve never had it in cake form, but it looks phenomenal! It’s the perfect thing for big parties when you want to feed a crowd. What a great idea! I have had tiramisu a million times but never had made it myself. This may have to be my first. Looks delicious! Wow that sounds like a delicious feast!!! tiramisu cake looks lovely and clicks are pretty! You had me at Tiramisu and I’m literally drooling reading the ingredients 😉 The cake sounds incredibly soft, delicious and no wonder you daughter requested it for her birthday. It just looks so flavorful, creamy and Tiramisu being our absolute favorite, this might get made real soon. Tiramisu is one of my most favorite desserts. I wish I can taste yoru recipe so I will have t make it. This is such a classic and perfect for a party. Hi, Adriana! 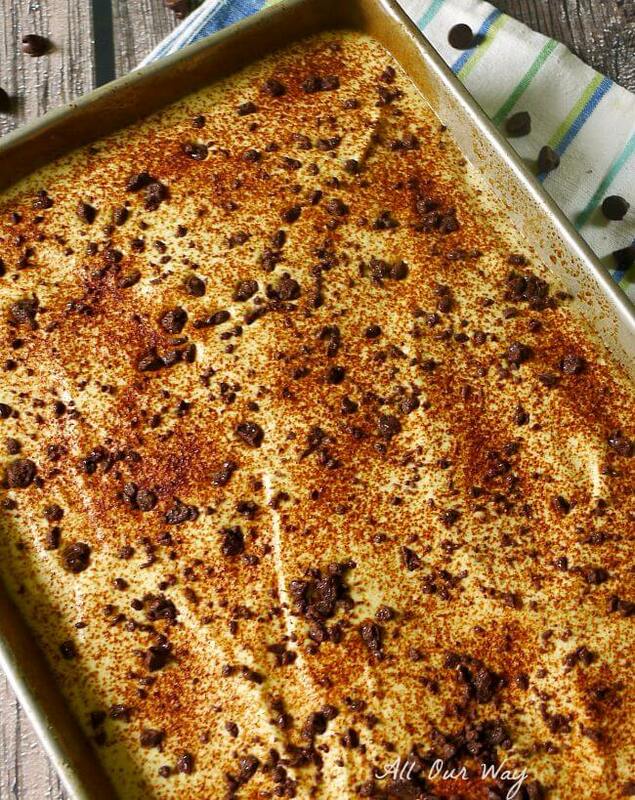 You’ll love the easy tiramisu recipe. It’s easy to assemble and tastes soooo good! Have a great day. Hi, Noel. I’m glad you understand. I’ve missed out on some terrific shots of recipes for that very reason — it’s gone by the time I get the camera. You can’t very well cook, serve, and wear a camera around your neck. 😂 Hey, here’s a thought, what about a body cam? Hi, Camilla! You’ll have to make it — so easy and good!! Oh I love Tiramisu. I made some last week with the finger cookies. Had not time to make a cake. Next time I’m making your white cake. Sounds so delicious. Hi, Veena! It sure is easier than finger cookies – you make such great pastries you could use any light cake.Have a great day! Oh, this looks wonderful!! 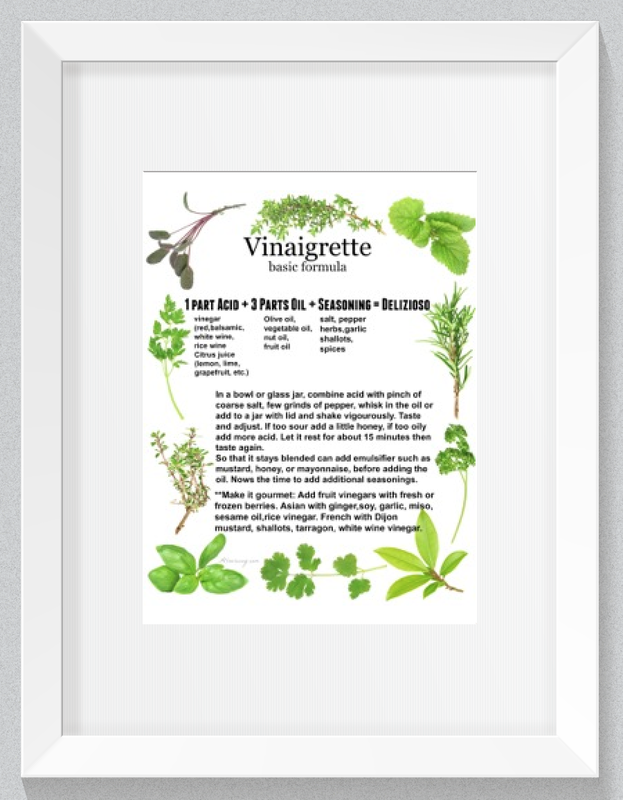 Perfect for family gatherings…so nice to have the whole family cook and get together. I love tiramisu and yours sounds like absolute heaven. Wishing I had a slice right now! Hi, Catherine! We are all avid cooks — and of course, we also love to eat. That makes a great combination, don’t you think? I can totally see why you missed your chance for a photo. This cake wouldn’t last 10 minutes around here! Hello, Stephanie! Most of the time I have to hurry and take the shot or miss it entirely. I really can’t complain because I love feeding my family. Hello, Renz! Thank you! The cream is very good on top — not too sweet, just right. I love anything tiramisu, it’s always my favorite dessert to find on a menu. This cake sounds absolutely delicious. Hi, Pam! The recipe is super easy. You’ll have to make your own tiramisu. I’m warning you though, it’s hard not going back for another slice. I can’t think of a more indulgent dessert than Tiramisu. While there might be lots of versions out there, yours sound like the real deal. I love a nice slice straight out of the fridge, such a treat in summer time. It’s really good, Daniela! This version is so easy and not as labor intensive but the taste is still there. YUM! You’re making me drool! I love Tiramisu especially on a hot summer day! I can’t wait for you to share the Panzanella recipe! I had it at a restaurant once and loved it! Hello, Hanady! Panzanella salad is right here: https://allourway.com/panzanella-italian-bread-salad/ It’s one of our favorite salads. Thank you Muna! We’ve had Tiramisu many times and different recipes. This is really easy to make and it is delicious. Whatever that cream is… I want some! Tiramisu is one of my fave desserts ever in the history of ever! I’m making another one this week — my daughter’s birthday. And since you’re coffee lovers, I’m also making espresso ice cream with mocha liqueur to go along with it. I know what you’re talking about when you say you were too busy eating that delicious cake to think about taking pictures. I have to hold people back for a bit and it can get tedious for people to wait. I can see why they wanted to dive into this beauty. You’ve posted so many amazing recipes in the last week! I was sick with the flu last week, so I wasn’t on the computer much – and didn’t even get to make your No-Churn Ice Cream! My oldest son’s favorite dessert is Tiramisu! I make him one version – or another – of it for his birthday every year. 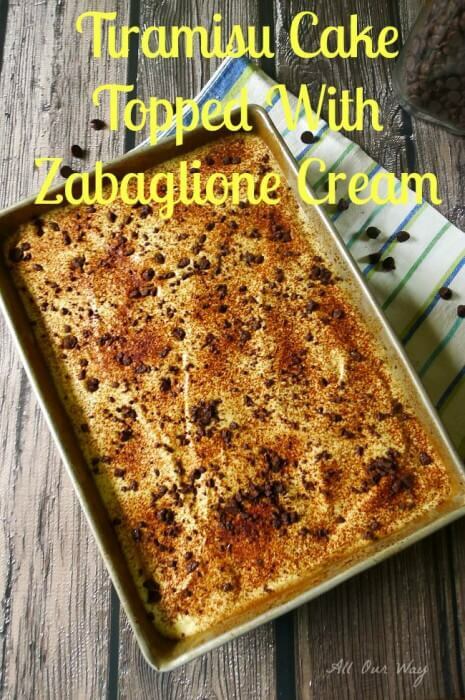 Your recipe topped with zabaglione cream sounds divine! I love your photos of it . . . and look forward to seeing your “properly staged photos ” :0) You’re too funny! It looks delicious! I can only imagine how much fun your family gatherings must be . . . delicious food! . . . fun people . . . sounds like a great time! What a feast! Such good food for everyone. Your tiramisu cake is a new one for me, especially with the topping. Definitely a treat for a special occasion. I make a tiramisu cheesecake that everyone loves. Now I have your creation to add to my list of desserts to make.